Reached by phone Wednesday, Cooper, the substitute teacher, stood by her claims that she reported a shooting threat to the office and said she felt pressured by detectives during her second interview. 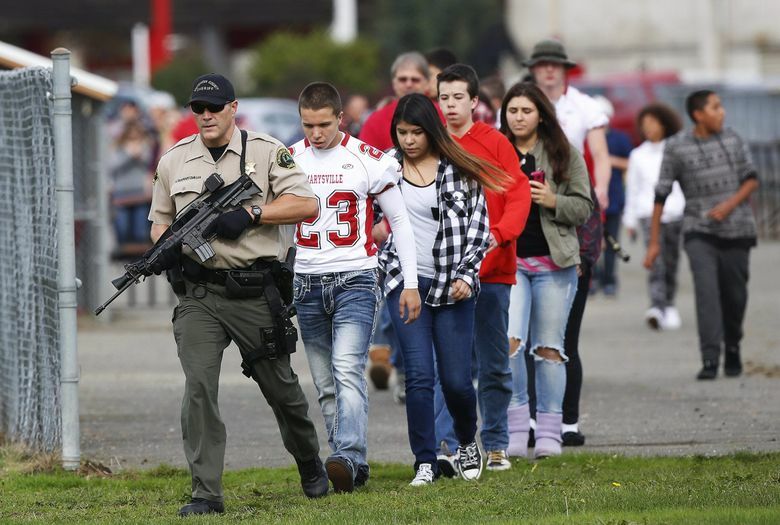 A substitute teacher working at Marysville-Pilchuck High School two days before a student killed four friends and then himself said a student told her about a planned shooting, and then, she claimed, she alerted the front office. Rosemarie Cooper told investigators in two interviews that when she subbed at the school two days before Jaylen Fryberg engineered his mass shooting, a boy approached her to apologize for a rowdy classroom and mentioned that a “shooting” might happen that Friday. Cooper told investigators she later reported the encounter to an attendance secretary, according to a newly released report. “I don’t remember word for word what I told her,” Cooper told Washington State Patrol Detective Jeff Rhue, during an interview Nov. 4, the second of two sworn statements she gave to detectives. Cooper, who was less certain about her account during the second interview, said she was told that such talk was not uncommon at the school. Cooper’s statement was among 1,400 pages of investigative materials released Tuesday by a multiagency team of more than 30 police detectives that investigated the school shooting. Police officials said Tuesday they fully investigated Cooper’s statements, but determined they were false and that the woman later backtracked. “Any report that the school had notification before the shooting occurred is completely false,” said Bronlea Mishler, a spokeswoman for the Marysville Police Department. In a telephone interview Tuesday evening, Linford Cooper, Rosemarie’s husband, said his wife stands by her original statements and claims investigators pressured her to change her account. “They don’t want the public to really know that someone knew about it two days ahead of time, but they did nothing about it,” he said. Along with Cooper’s statements, the records released Tuesday included scores of never-before-disclosed witness interviews, detective’s notes and other documents compiled during the 10 months the investigation team probed the mass-shooting. The reports detailed dozens of eyewitness accounts of Fryberg standing and shooting down students seated around a lunch table. The records also included statements from several instructors as well, including social-studies teacher Megan Silberberger, who saw students on the floor and Fryberg shooting and moved toward him. She said Fryberg put the gun under his chin and pulled the trigger. Another teacher, Peter Zeller, said he and Fryberg had a tense exchange in his English class just minutes before the killings. Zeller said Fryberg was being disrespectful to other students, had his head on his desk and was looking at his phone. Zeller said he walked over to Fryberg and told him to sit up and pay attention. Minutes later in the cafeteria Fryberg pulled out a .40-caliber Beretta handgun from the backpack and shot five classmates, killing four. Killed were Zoe Galasso, Gia Soriano and Shaylee Chuckulnaskit, all 14, and Andrew Fryberg, 15. All were shot in the head. The report indicates that Fryberg, 15, was angry over a breakup with a girlfriend as well as a fight he had had with a fellow student in the days before the shooting. 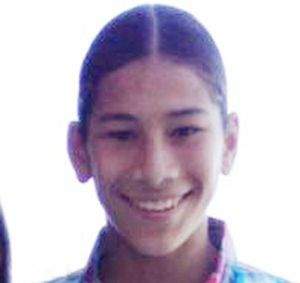 The records detail how Fryberg then invited his five friends to meet him at the school cafeteria Oct. 24, then fatally shot four and wounded one before turning the gun on himself. One student said Fryberg had been the brunt of racially tinged bullying and that Fryberg had finally punched the other student. That student played on the football team but attended the district’s Arts and Tech school on another campus and was not in the cafeteria during the shootings. Raymond Lee Fryberg Jr., Jaylen’s father, later told investigators the pistol used in the shooting was his and that he kept it in his pickup. The senior Fryberg now faces federal firearms charges because he bought the handgun and several other weapons while he was legally barred from owning guns due to a tribal domestic-violence restraining order. The elder Fryberg told investigators that after his son arrived at school that morning he sent him and at least 14 relatives a text message that “described in great detail which of his family and friends received his property, what he wanted to wear in his casket and asked his family to apologize to all of his friends’ families,” the records show. Another student who was in the cafeteria during the shooting told detectives he later found a bullet at the bottom of his backpack. The bullet traveled through the pack’s fabric, an ice pack and his composition book, the boy said. Much of the information released Tuesday had dribbled out publicly in various media reports since the shooting. Cooper’s statement about notifying the secretary about what she’d heard in the classroom appeared new. She told detectives that two days before the shooting she recalled a boy in her class mentioned seeing a tweet about a “shooting” that might soon happen. Cooper said she later reported the encounter. “Yeah, I told the attendance secretary that there was some serious concern, that a young man had come up to me and that he said something about, uh something serious going down on Friday and uh I thought he said shooting,” Cooper said in her statement. Investigators twice interviewed Cooper, who seemed less certain about what she heard during her second interview. She indicated she had a poor memory. Detectives later interviewed staff members and the boy in Cooper’s class; none corroborated her statement. The boy insisted he didn’t tell the substitute teacher that a shooting was going to happen, a detective’s report stated. “I have no reason to believe (the boy) was being deceptive,” the detective wrote. On Tuesday, Linford Cooper, 68, said that after the last interview investigators warned both him and his wife not to make any more statements “or they’d arrest us.” His wife, who has been a teacher for decades, stands by her original statement, he added. A school nurse (initials JG) was interviewed by detectives after the shooting. Megan Silberberger, a social studies teacher, told detectives she witnessed Fryberg commit suicide. Seattle Times staff reporters lkamb@seattletimes.comLewis Kamb, jensullivan@seattletimes.comJennifer Sullivan, pcornwell@seattletimes.comPaige Cornwell and mcarter@seattletimes.comMike Carter contributed to this story. Information from Seattle Times archives is included in this story.